Recently ordered a pack of nylon strings, and on opening the pack realized that only the first 3 strings are nylon, but the last three (4th, 5th, and 6th) are wire-wound, and appear to be steel core. However, they are quite whitish in-spite of the metallic appearance (most of the steel-core wire-wound strings are brassy look). Have I been cheated ? Is this a substandard set ? 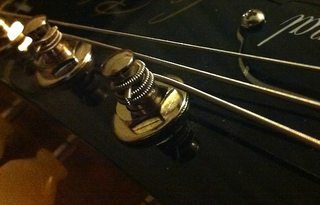 Has a bridge to which the strings can be tied, although it does have a tail-bracket into which steel-strings with ball-ends can be fitted quickly. However, this is a guitar I bought used, some 30 years ago, and the seller had steel strings. It was my first and only guitar for next 10 years, so I've to admit that I am not 100% sure if it is indeed a real classical guitar. Also, after having strung the guitar with the new pack, I've realized that the strings are indeed nylon (even 4th, 5th, 6th, even though wirewound are not stiff and hard to tie into a knot, as the steel string... which is in fact impossible to tie into a knot without snapping them). However, it was a nightmare to get the guitar to tune, and it just refuses to stay in tune for 5 minutes. It wasn't the case while the guitar was strung with steel strings. 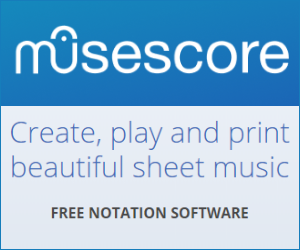 This could mean that it might note be a classical guitar then, although I'd have though that a steel-string guitar could be strung with nylon string, but not vice-versa. This is completely normal, the cores under the windings are nylon, just as the unwound strings. They are wound to provide a lower pitch when plucked due to an increased mass. The unwound strings need to produce a higher pitched note and are therefore left unwound. Different brands/types of windings have different colors. Phosphor Bronze windings have a coppery color while steel or nickel will have a more silvery color. But I'm very certain that these are normal nylon strings – the fact that it doesn't keep tune further confirms this: yes, this is annoying, but inevitable for nylon strings (due to their much greater elasticity); you'll need to keep retuning the guitar after every hour of playing or so during the first week with new strings. After that, the guitar should then keep the tuning reasonably well (apart from temperature effects, which classical guitars are quite sensitive to). That is, provided the guitar is still alright. I wouldn't be too sure about that: classical guitars aren't meant to have steel strings on them, and it's quite possible that the guitar has suffered permanent damage from them. In fact I'm rather surprised it has survived for 30 years this way! Sure about the steel core? At any rate, when buying nylon string sets, three or occasionally even four strings will be wire-wound. And indeed it is pretty much exclusively one of the wound strings that gives up the ghost first. But that's not substandard but very much standard and I'd be surprised if your previous set was different. The coloring is usually somewhat matched between the wound and the naked strings. Again, that's not unusual. 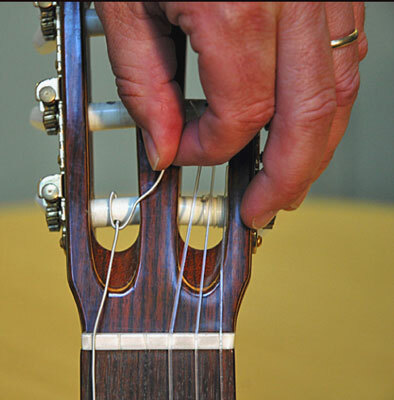 If they are for a proper classical guitar, when you tie that special knot to hold them to the bridge, you'll know if they're steel or nylon on the inner core. If you can't tie them because they're too stiff, then yes, you've got problems. However, if they tie easily and properly, then they are good for the job. However, you labelled acoustic guitar as well. It's unusual to use nylon strings on these, and the strings will all have to have ball ends to fit to the bridge (or tailpiece). Nylon strings- wound and plain- don't have ball ends. Not the answer you're looking for? Browse other questions tagged guitar acoustic-guitar classical-guitar or ask your own question.